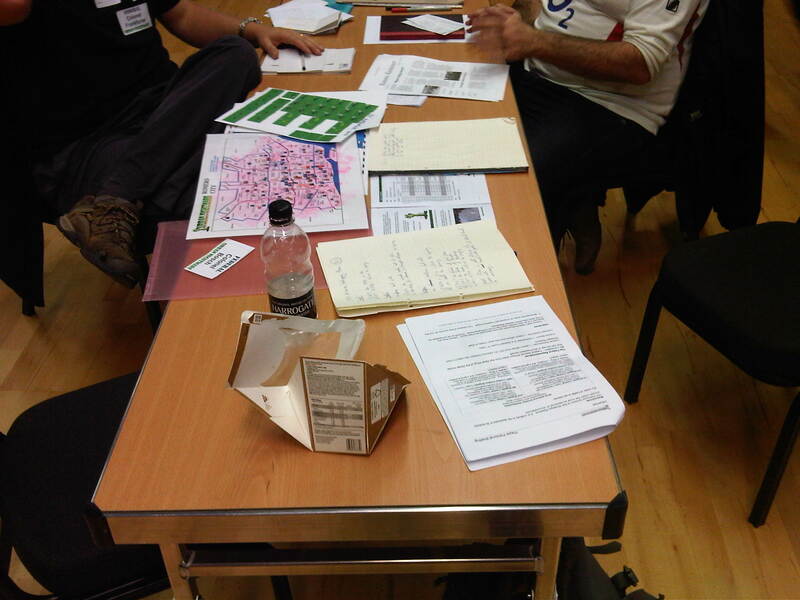 Urban Nightmare: State of Chaos- the first ever Wide Area Megagame. 1/7/17. Last weekend saw the first event of its kind a ‘wide area megagame’, simply put this saw multiple venues each put on the same megagame all at the same time with interaction between each game possible. Jim Wallman of Megagame Makers came up with the concept and scenario, a monumental expansion of earlier game designs of his, and bravely decided to make the experiment happen. The scenario saw a zombie outbreak hit modern day USA; each venue hosted a game representing a single state, whilst in London there was a game set at the Federal level that was linked to all the other games concerning itself with shuttling resources about. In all there were at least 500 players in 11 locations in 5 countries (1 game each in Canada, Holland and Belgium, 2 in the USA and the remainder in the UK), it goes without saying that to have simultaneous gameplay with time differences the players in the Americas had to get up rather early. Each state was made up of several cities, each with their own police, emergency services and Mayor, state police and National Guard as well as a State Governor. In additional there were a few players taking on the role of Federal Liaison linking them to the Federal game in London. Pennine Megagames decided to host two of the games rather than just one. 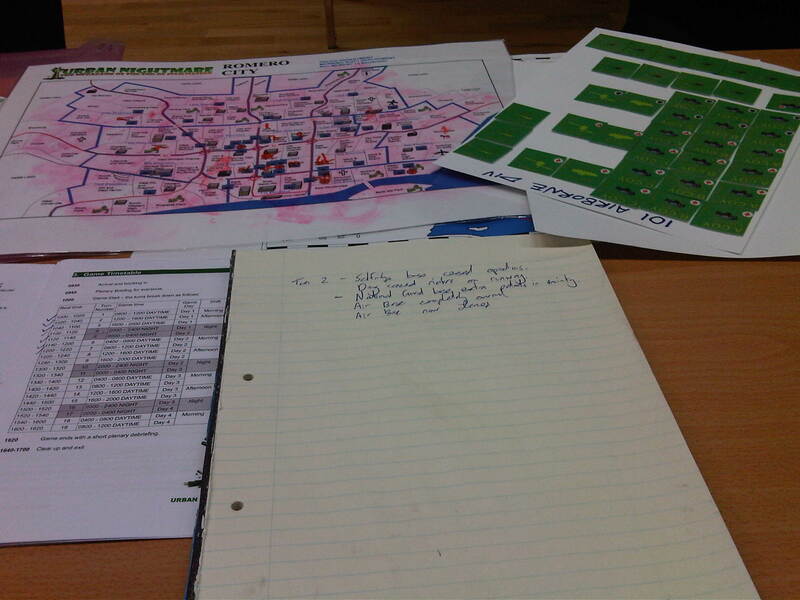 I was originally slated to be a city control for Leeds but due to a personnel change I ended up going down to Birmingham to act as WAMCOM (Wide Area Megagame COMmunications) control, I had the job of co-ordinating any game information that had to flow from my game to any other and vice versa. The meant I had a much better idea of what was happening in the rest of the game but surprisingly little of the detail of the Birmingham game. Accordingly, I can only give an account of how I felt the game ran rather than the detail of the happenings within the state of Shawnee (basically Kentucky). For a better insider’s look, you’d be best off heading to Facebook and reading the player’s reports on there. The players seemed to get into their roles with gusto, with separate cities there was much politicking going on as there were state wide elections to be considered while trying to stop the zombie outbreak. 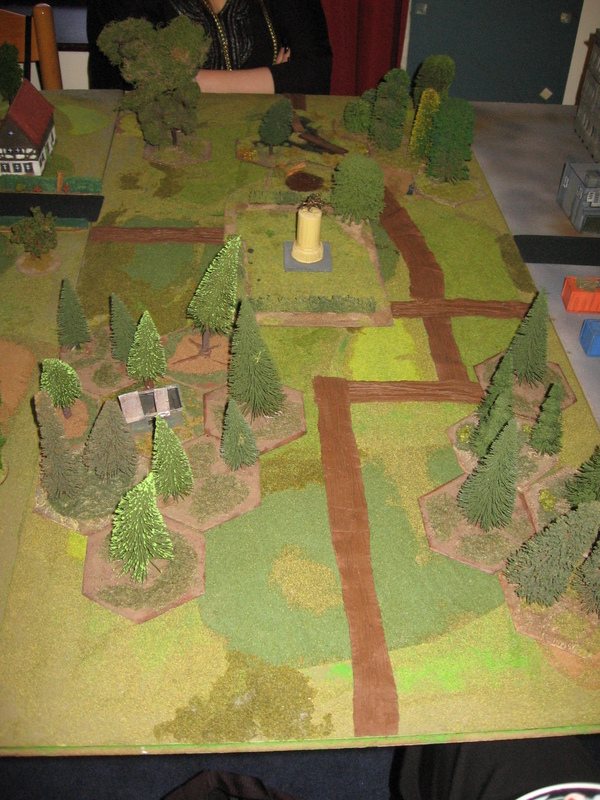 Unlike the previous Urban Nightmare games this one had an open map meaning the players had to interact with the rules directly and there was a lot less hidden information about zombie numbers and strengths. 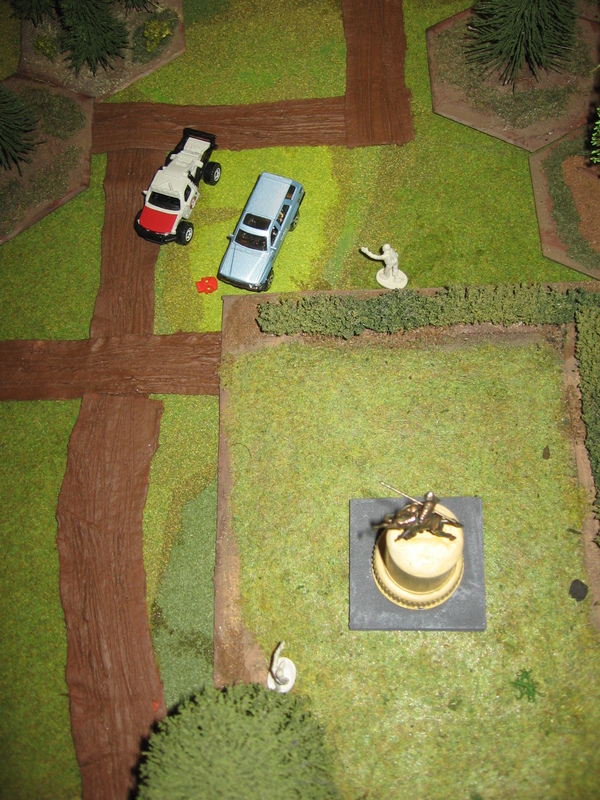 In the other games, the zombies were played and human directed but given the Birmingham game had relatively little control so the zombie spread was administered by them, I think that this made the job of the Shawnee players a bit easier than that of the other games. From the emails that I got in the early part of the day the zombies hit hard, many cities declared a state of emergency (necessary to call in state assets) after only a few turns of the game. This didn’t surprise me that much as I had helped to play test the game before hand and new that they had the potential to get out of control very quickly unless the players were very aggressive early on. After a few cities had fallen states were announcing a state of emergency so they could get access to federal help; Shawnee was the last state to declare a state of emergency. I did write little notes to keep our political control team up to date with the nationwide state of play, these were then passed on to the press team player, the media played an important part of the game, necessary in any game set in the present day really, these became known as the post-its of doom as I never had any good news to pass on. Not sure how many made it to the players as I know that most of the new generated was to do with our own state. 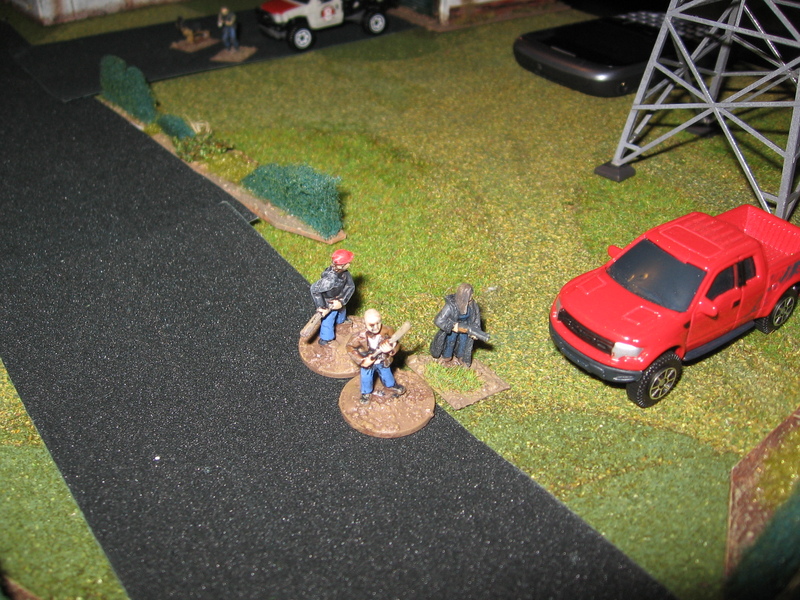 By the middle of the afternoon several of the states were in mass panic with cities completely overrun with zombies and in some cases completely abandoned to their fate, in comparison the Birmingham players were doing well. Rumours abounded of other state’s governors being hunted down and arrested as well as one state being taken over by a National Guard coup (there were rumours at this point of a nuclear weapon being used, I’m not sure one was but I did see a picture of a release form allowing the use of unconventional weapons signed by a state governor. I’m not sure what the federal team were up to but a great deal of military hardware was released to them along with all manner of experimental medical equipment. In the end, I think a cure had been developed and then aerosolised and was being prepared to be spread out over the states. This came at a terrible price to both lives and infrastructure of the affect states through the four days of game time. It was great to go on something of a megagame road trip to a new part of the country and see some new faces. Hopefully they’ll make it up to Manchester at least for future games. Will there be another Wide Area Megagame? Who knows but I’d like to be involved if there is based on my experiences of this one. Everyone in Birmingham had a great time and it was great hearing all the individual game stories in the pub afterwards. 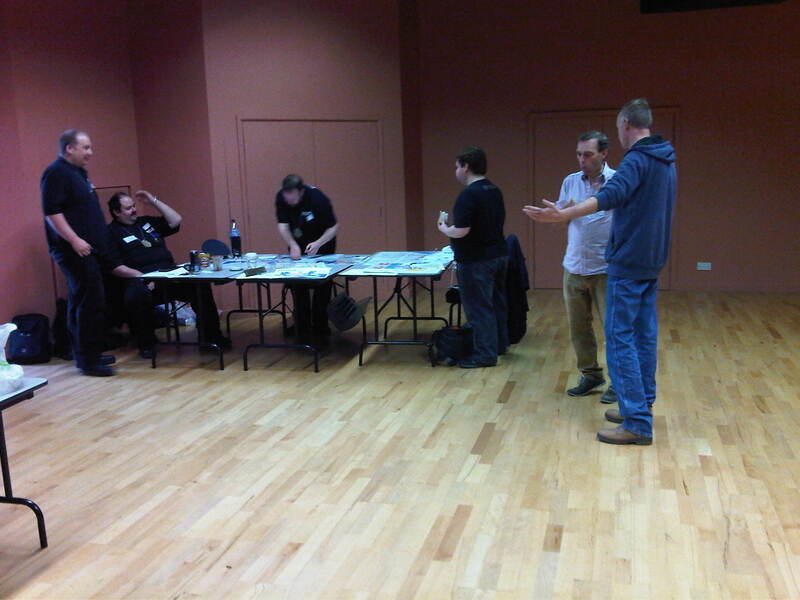 Pennine megagames hosted a rerun of Jim Wallman’s Ubran Nightmare game in Leeds. A crisis management game where the players run different components of Romero city and its surrounding state (The game is based on the ’60s riots in Detroit, Michigan). With teams as diverse as experimental scientists, Emergency services and Federal level special ops it was a heady mix of teams in a semi co operative fight against the game mechanics. My role was to be the control to the rather Gung- Ho National Guard time. They were intent on killing as many Zombies as possible as quickly as possible and certainly kept me busy that day running their orders from the team table to the main map. Tim who hran the game did a great job of trying to modernise Jim’s design which I think is coming up for being 20 years old now but there was still some clunkiness in its mechanisms that let the game down. Still all the players seemed to enjoy it which is the main thing. Jim ran a quick Control Seminar in Huddersfield as a master class in how to be an umpire/ control. To illustrate this he used a quick little game Folkstone Nightmare. The 15 or so of us there quickly got stuck in and I think we all learnt something that we will take forward to future games. Zombies in Leeds: A Megagame. On the 17th November Brian (Count Zero), Chris, Paul and I headed off to the Royal Armouries for a megagame based around zombies. 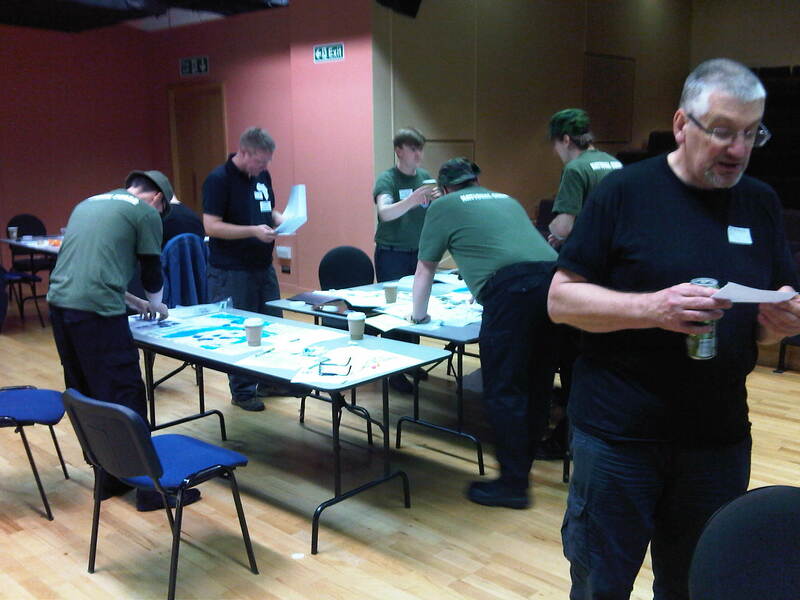 Like last years game (Operation Goodwood) it was put on by Jim Wallman/ Megagame Makers. The Briefings had arrived the preceding week in the post so after a quick briefing we were all ready to get down to business. The game was set in Romero City (any similarities between this fictional place and Detroit are just pure coincidence) in ‘the State’ which bordered ‘North Land’. Brian took the role of Deputy Mayor. Chris controlled the Emergency Services- Fire and Ambulance. Paul was part of the sinister corporation ‘Necrotech’. I had a slightly easy role- that of part of the Federal Reserve- 101st Airborne liaison Officer. I considered my position to be like the US cavalry in an old western film- ride in at the right moment and save the day…. Other players roles were the State Government, State Police, Media, National Guard and the Local Police. The last two groups made a real effort in terms of fancy dress, matching dress, fancy hats, mirror shade and even Police badges and a pile of donuts for the Police table. The game started fairly slowly for us sat on the Federal table, my fellow teammates were Carl and Simon, both decent guys and a pleasure to game with, as we could only be called in after a request from the State Governor. As a result we spent the first few turns contingency planning- I went through nine different drafts, and going through our rather extensive and powerful assets list. In fact a lot of our strategy revolved around what we hadn’t used yet. We did get various reports filtered up through the various agencies about what was going on, which with then had to evaluate and possibly advise the President of. Rumors of the annihilation of the police, outbreaks of zombies elsewhere in the state and border tensions with ‘North Land’ were all discussed and plans were altered. The lad who took on the role of the media- ‘Stoat New Network’- was our main news source. In fact I’d happily nominate him for the man of the match; almost every turn he produced a full A4 front page of news from the game, a result of running around interviewing the protagonists. Occasionally play was stopped so a full new conference could be called. When we were finally deployed I decided on no half measures- Companies of Paras with armour support pushing back into the city. By this time the Local Police had been evacuated, the State Police were setting up and administering refugee camps outside the city. The National Guard were in the city holding the center, judicious use of helicopter gunships and artillery kept the zombies at bay whilst they evacuated civilians. At this point my favourite part of the game occurred; Chris wanted some support to get his firefighters through (a man on a mission protecting life and property); where the fires were was deep in infested territory so the only thing I could offer him was a few helicopter gunships. I was skeptical, the umpire skeptical but I thought what the hell, the Government is here to help. Next turns Chris said it worked like a dream so for the rest of the game the RC Fire Department had gunships on top cover. Whilst the battle for Romeo City was ranging, Necrotech had come up with a possible chemical solution to the problem, with a bit of federal help. Any rumors that SOF troops snatched live ‘samples’ is completely unfounded… 😉 A small scale test went well, after that is was just a matter of spreading the love across the city, that and tidying up a few last areas with Fuel Air explosives from the Federal arsenals. Looking towards the National Guard. Whoop Whoop, Dat’s da sound of da Police. At this point head umpire Jim Wallman called the game. 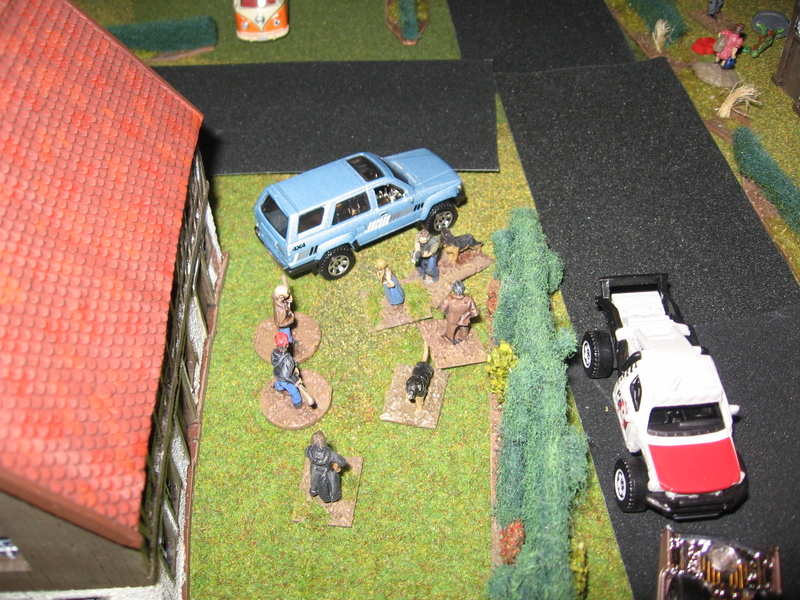 The city was surrounded with the civilians evacuated and a chemical ‘cure’ found so a successful game, this was the opposite to the previous run through of the game in London. All in all a great day’s gaming, and we’re all looking forward to future megagames in Leeds. 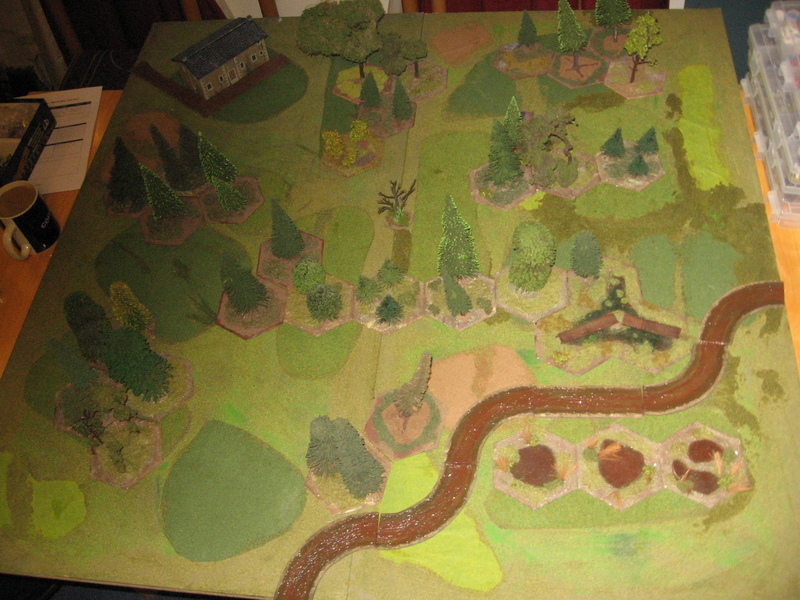 Right we’re 2 weeks in to our Zombies campaign so I thought I upload some pics and outline where we’ve got up to. Given that half the group is new to the system we started fairly slowly with some smaller games. Brian (GM’ing/ umpiring the games) decided to set the opening game on day one of the Zombie outbreak and gave us 2 small 4′ by 2′ boards to fight down so the beginners got a chance to get familiar with the mechanics before they were overwhelmed with the undead hordes. Our character were all REP5 stars with 2 attributes each. 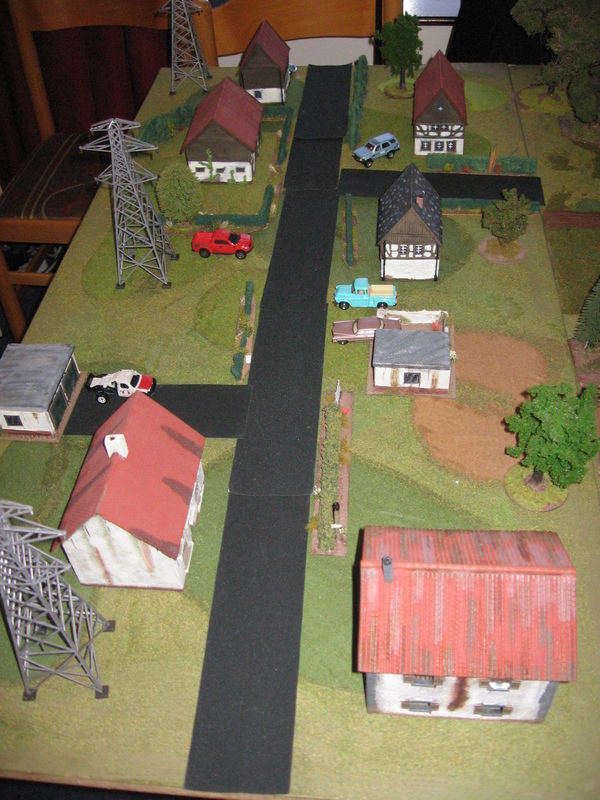 The first board was a simple suburban street. Our party had to go from one end to the other to get to our cars to drive into the city- my police officer had to report in. Keeping things simple got players used to the mechanics such as Fast Move. Spotting the first Zombie… a quick nip into the house for guns and an even quicker shot resulted in an ex Zombie. With all of the PCs in their respective cars the action on that board ended. … and running over Zombies. With the 2 mini games completed that was the end of the first session. For the 2nd session the following week a bigger game was planned by Brian. 3 of the characters (one player was missing) were tasked with going to a hunting lodge to rescue the Police Chief’s (my character’s boss) father and daughter. Arriving at the lodge our PCs found out that they were fishing at the stream. Advancing towards them we could hear screams so hurried along. Zombies approached the father and his granddaughter. The man died of a heart attack, causing the girl to scream, attracting the zombies. We got there in time to fight off the zombies and rescue the girl. 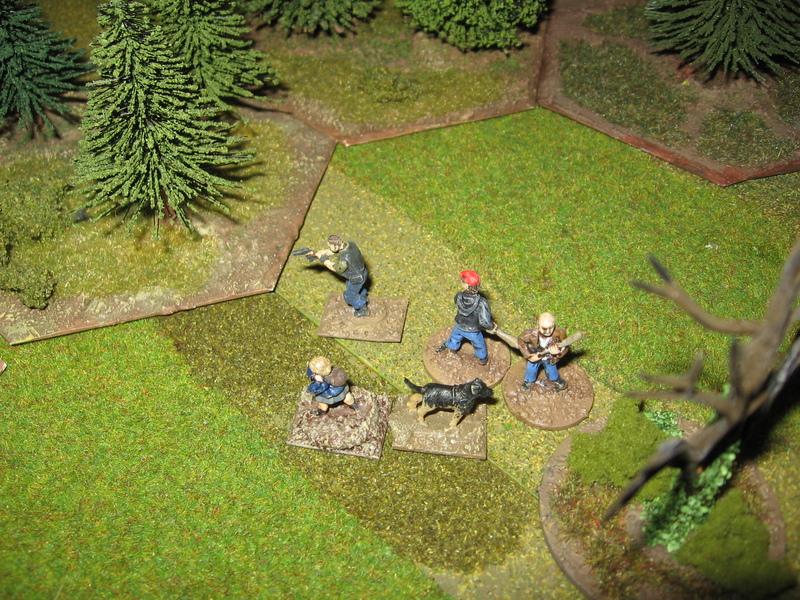 We moved cautiously out of the woods shooting the zombies as the appeared. Given the low number of zombies that appeared it was relatively easy to shoot our way out… as the in the next session I have been reliable informed we are heading into the city it may bit a bit trickier. All in all 2 great sessions of gaming. As part of my modern dystopia project I needed some rioting figures, so last Triples I picked some suitable ones up from Irregular and Combat miniatures/ Stonewall. I decided to use the sabot bases from Warbases as movement trays; the little filler bases are there mainly to allow the figures I used to go further. I’ve finished the first four bases and I’ve got five more to go. They should be useful for my zombie games too…. I mentioned quite a few posts ago that my group had played ‘All Things Zombie’ by 2 Hour Wargames, well this Friday we are starting a full campaign…. Friday night is usually RPG night, but experiences with recent RPG has left me feeling there is no roleplaying any more just a skirmish game done badly (RPG combat systems rarely make any sense), so the four of us decided to give a Zombie campaign ago. ATZ has a proven, working combat system and enough bolt on character elements to make things interesting. A game of ATZ consists of your character(s) exploring the table to find more allies, guns, supplies etc whilst fighting/ avoiding zombies. As such it’ll be up to me each week to set up the table; as noted last time I’m rather short of intact buildings (90% of mine are damaged). To this end I turned to the very old range still carried by Dapol. I picked 2 kits up at Halifax Modeller’s World and 5 arrived this morning from Gaugemaster. Also I dug out an old Heljan kit I’ve had for 15 years and not made; its a satellite dish mounted on top a building: should be an interesting objective. 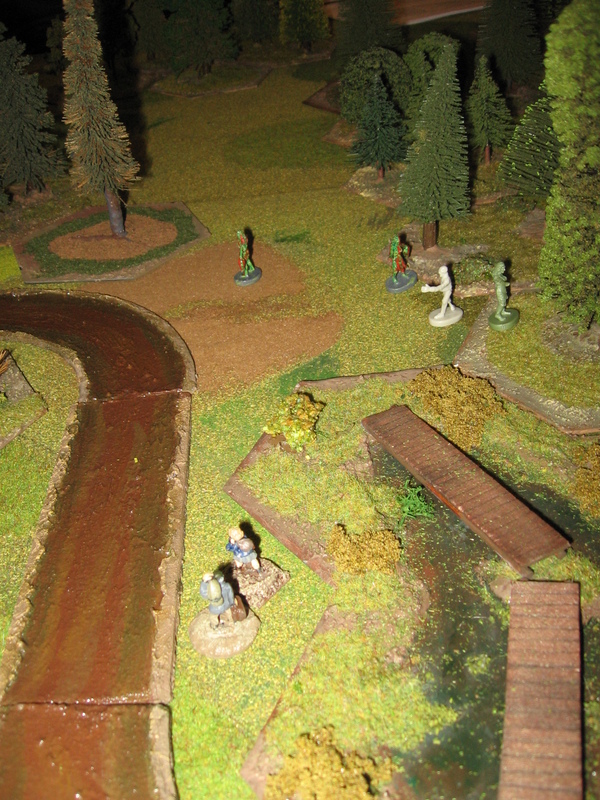 In fact I’m looking forward to getting some terrain built up especially for our campaign. I’ll ask everyone to see if they have any in mind that want in the game, in a quick chat with Brian a dock, prison and army base were all mentioned. The Dapol buildings will come in handy for other projects too: any Cold War goes hot games as well as my previously mentioned Urban Dystopia idea. On that topic a small package of figures arrived from Eureka: some SLR armed squaddies and some Squaddies kitted out for riot duties. I recently picked up a Saracen and Land Rover ambulance too, from JB models, now Airfix. All I’m wanting for the project now is another Saracen, 2 Shorlands from Hobby Den and I’m pretty much set. Once I’ve got the building glued and painted I’ll put the pics up. For a bit of light relief we played a game of All Things Zombies ( or All Tomorrow’s Zombies as I inadvertently keep calling it). 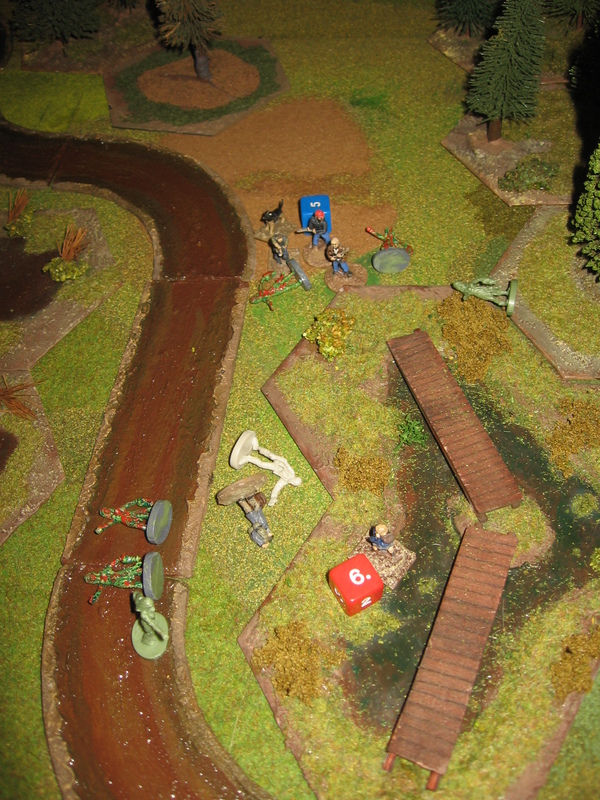 It is published by Two Hour Wargames- our groups seems to be standardizing their range for all our 20mm skirmishes. It is nice to learn one basic system that works through a variety of periods. The rule set is really nice- really captures the feel of all your favourite dodgy horror films. Create a gang before hand with afew quick dice rolls then set up your table and spend the game interacting with it i.e. raid buildings which might be empty, housing other survivors or more zombies, look for supplies, try to get a car going. 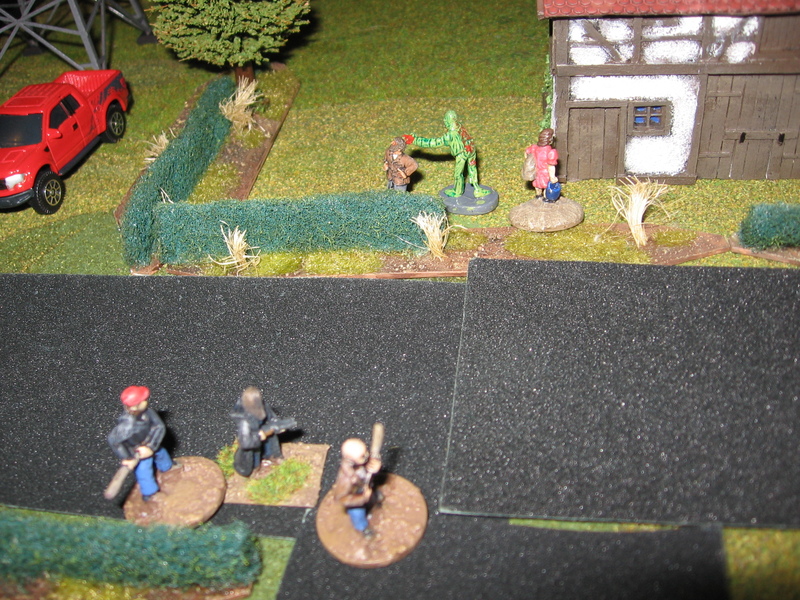 One nice feature of the rules is that when your fire or try to drive you attract extra zombies. Clever use of this can be made to draw them away from where you want to go or lure them on to other unwary players (thanks Evan 🙂 ) the little green dice in the pic indicate this. It was a bit of a struggle to find enough undamaged buildings in my terrain collection so that explains the different styles on the table top but the end result seemed good enough. I used Elhiem and the infamous ‘Bag O Zmbies’ for the living dead. 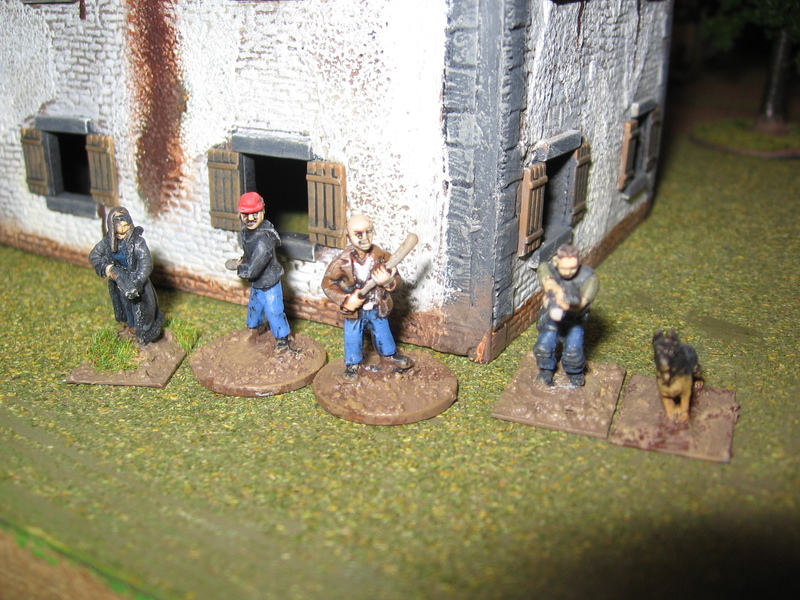 Civilians were from Elhiem, Liberation, Platton 20 and the old GW Dark Future range. The cars were just cheap toys I’d picked up.